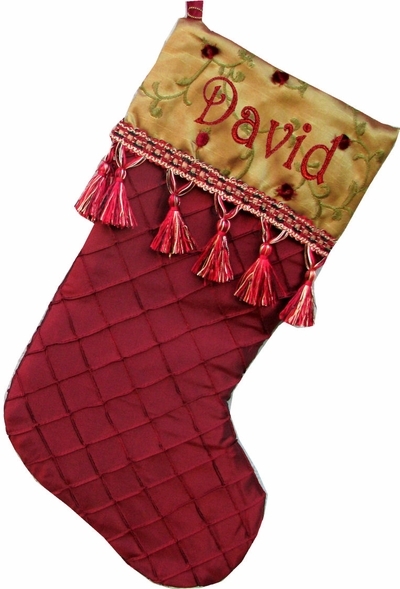 This stocking has a diamond red body with a golden cuff and tassels that wrap around. The cuff has embroidered vines with roses that are simply picturesque. It truly is a one of a kind stocking with all the detail that went into it, it is sure to be the centerpiece on your fireplace mantel. Measured The stocking is plenty big, about 18 1/2" diagonally and 8" wide. Materials: The stocking is made from red and gold organza which is a sheer rayon, nylon, or silk fabric constructed in plain weave and with a crisp finish. The cuff is trimmed with elegant black, red, and gold tassels. Lining: YES. This stocking is lined inside with red polyester.